Where 'fast' and 'moving' are essential parts of the sector nomenclature, can a forward-thinking business fuel such as Brand Capital be far behind? With the Indian economy poised to triple consumption by 2025, riding on a vibrant FMCG sector composed mainly of food businesses, there is massive action, high growth opportunities and leaping potential in the fast moving consumer goods category. While established brands are adapting speedily to a changing consumerscape, new and ambitious startups face challenges ranging from how to win the big game to how to effectively impact niche play, Having mentored over 180 companies since 2014, Brand Capital, the strategic investment arm of The Times Group, hosted a closed door Scale Up activation for growing businesses in the FMCG sector recently in Gurugram. Budding entrepreneurs met industry veterans who shared category insights and actionable ideas on how to make a mark in this dynamic sector. Mentee Companies Mainly from F&B and Wellness segment accounting for more than a quarter of the Indian FMCG sector. Each company had their own unique product and propositions; and thus challenges faced were equally distinct. Clensta (makes waterless personal hygiene solution) focused on right partnerships and building proper distribution network. Oddy Uniwraps (produces recyclable, safe food wrapping paper that can be used to reheat food in ovens) focused on brand awareness and BTL engagement. Teafloor (produces online tea store with customised range of tea varieties) focused on the threat of competition and easy accessibility to substitutes. To-Be-Healthy (TBH) (manufactures delicious, premium and nutritious snacks) focused on tackling high cost of raw materials, credit lending and sales efficiency. Whyte Farms (delivers fresh and natural milk straight from farm to homes) focused on optimizing sourcing and faster market penetration. Mentors The panel of mentors included Ashwani Arora, Managing Director, LT Foods Ltd., one of India's leading rice brands; Ajay Batra, Founding Director, Center for Innovation and Entrepreneurship & Bennett Hatchery, Bennett University; Aseem Soni, CEO, Modern Foods with 25 years of business experience; Sharad Saluja, Director, Sterling Agro Industries Limited, a business engaged in the manufacturing and sales of all kinds of dairy products; Pranav Gupta, Vice President, Carpediem Capital - a PE fund focused on the India consumption opportunity; Sona Mazumdar, Chief Partnership Officer, KidZania, and Kshitij Torka, Vice President, Grofers. Success Mantras For FMCG StartUps: Grab It Before It Goes - The "attention economy" is limited. One has to grab the attention that someone else has today. Jo Dikhta Hai Woh Bikta Hai - Marketing and positioning is as important as the product itself. Know Your Consumer - Advertising and promotional campaigns should be crafted with the audience in mind and the channel used. It is crucial to highlight the personality of the product. Always Be Connecting - While building brand loyalty is necessary, the campaign should always evoke emotions and imply connection between product and goal. Judging The Book By The Cover - The best way of captivating consumers and standing out is to have unique yet informative package design. This is the first thing a consumer sees, and therefore, is as important as what it contains. Niche Needs - Niche products are relevant as long as it understands where its audience is. This might require understanding the mind of the consumers through focused group discussions and qualitative analysis. Lose The Battles, Win The War - Start-ups have limited time and resources. And companies must focus on core competencies and outsource activities like distribution and supply chain. Brand Capital is the strategic investment arm of The Times Group, with a portfolio of over 3 billion dollars. As a key player in the investing ecosystem, Brand Capital ' Scale Up connects ambitious entrepreneurs to industry experts who provide closed-door mentoring in areas such as business strategy, branding, distribution, finance and funding. To get invited to the next up Scale Up event near you register at www.brandcapital.co.in / Follow on LinkedIn and Twitter. Spices truly form the core of Indian cooking. Culinary delicacies are incomplete without the fascinating condiments that add distinct flavour and the aroma of authenticity in an instant. Since inception in 2005, Sparsh Masala has taken pride in offering wholesome Indian spices with the promise of purity. Established by Shivakumariah, an ex-army official, Sparsh saw its beginnings as a supplier of raw basic spices like chillies, turmeric and coriander. In 2012, the brand attained accreditation from ISO 9001:2008 and 22000:2005 for its quality. The next generation entrepreneur Deeksha S Kumar entered the fray in 2015. A dynamic personality, she has worked tirelessly towards organically growing the brand through aggressive marketing strategies and developing a strong distribution network. Today, Sparsh offers 60 variants of ground spice powders, whole spices, condiments and more. Using only the highest quality of raw materials, the products are carefully manufactured, to retain taste and aroma. The brand has been chosen for the award Fastest Growing Kitchen Brand in the Times of India Business Awards 2018. Sparsh Masala has the winning combination of the energy and tenacity of youth and the solid dependability and wisdom of the experienced. The company has spread its wings to extend its presence across Karnataka and its neighbouring regions. With steady growth and increased penetration, the brand is sure to emerge a forerunner in the industry. Being true to an authentic taste palate Sparsh Masala will continue adding a magical flavour to your favourite dishes. The JobBuzz Workplace Index for June 2018 identifies hospitality as the best sector to work for in India, owing largely to a good work culture that exists in this sector. June 15, 2018, New Delhi: Hospitality sector jumped from the fourth slot (in May 2018) to grab the first position in June 2018 edition of JobBuzz Workplace Index - a monthly ranking report of industrial sectors to work for in India. Notably, this ranking is based on the reviews and ratings provided by employees working in the respective sectors and hence is a holistic encapsulation of the prevailing sentiment of Indian employees. In June 2018, hospitality led automobiles, infrastructure, and pharmaceuticals as the best sectors to work for. Employee reviews were captured based on different factors as salary, work-life balance, work culture and career growth among others. These sectors garnered most favourable employee sentiments in June 2018. In terms of work culture, close to 79% of Indian employees found hospitality to be the best segment to work for. Surprisingly, consumer durables sector - which was topping the charts consecutively for last three months - toppled down to the ninth position in June 2018. With an overall rating of 74%, hospitality sector was largely recognised for its favourable work culture. In terms of salary, the automobiles sector was ranked as best among all other sectors. Employees from the automobiles sector posted favourable reviews and gave a high ranking for salary offered by companies in automobiles sector. DOWNLOAD THE June 2018 EDITION OF JOBBUZZ WORKPLACE INDEX at http://content.timesjobs.com/photo/64574474.cms About JobBuzz Workplace Index: The JobBuzz Workplace Index is a compilation of employee ratings from across a selection of companies varying in size, geography, and industry on various critical workplace parameters. The index value has been kept at 100. The percentages are an indicator of ratings being provided by the employees on JobBuzz for their respective companies. It is no secret that packaged foods is a concept that is built on a deep understanding of consumer insight and a constant requirement of innovation. From the packet of chips that we so readily dig into, to the jams that are liberally applied on rotis and breads across households, convenience foods has taken on a significant avatar to the consumer. MTR is no stranger to how an insightful packaged product can change a consumers and manufacturers life. In the 1970as we had to shut down our iconic restaurant for a short duration and realised the role packaged foods can play, to keep up our operations. The need to stay alive coupled with the demand from consumers for our loved products, gave birth to our packaged foods business. From there came our vision a to be an indispensible companion in every kitchen to help create authentic and delicious Indian food. The consumer of today is vastly different from that of a few years ago a technology has taken over our lives a making it simpler and more complicated at the same time. Our target consumers do not have the time, technical know-how and sometimes even the inclination to make food from scratch a specifically Indian food that is perceived as cumbersome, heavy and time-consuming. We need quick solutions to our food dilemmas a similar to what we look towards technology for. Food plays an emotional role in our lives, but with the advent of this fast-paced life, we donat have the patience to wait for it. With a click of button, great tasting food should reach our doorstep, ready to consume! This is where the heavy dependence on innovation comes into play. No other industry studies the consumer as deeply as the packaged foods one. At every step of a consumers food journey, from the time they need quick meal solutions for extremely busy weekdays to their desire for comfort home-food on lazy weekends, companies like MTR need to be the consumeras provider. MTR has always studied, gained extensive insight and stayed ahead of the dynamic consumption patterns that dominate the landscape now. We conduct in-depth research on food cultures and sub cultures, ongoing trends in the industry, varying cuisines in different parts of the nation, diverse taste preferences of people and consumer requirements. The recently launched 3-Minute Breakfast Range is a great example of an innovation based on deep consumer insight. The Breakfast range is a result of reams of studies and observation, wherein it clearly showed the importance of eating breakfast. However, hectic lifestyles and increasing time-poverty have led to an increasing trend of youth skipping this meal altogether. Yet, if the time dimension and cooking-knowledge are taken out of the equation, the Indian consumer is sure to choose an Indian breakfast to a western one. Another innovation that has taken center stage in kitchens across India has been Spicy Sambar Powder. MTR Spicy Sambar Powder is the result of extensive consumer research with close to a thousand consumers and an in-depth cuisine study done in the state. The study threw up some interesting insights such as the distinct tastes of sambar made in the same home according to the palate of the consumer, meal occasions and the central dish i.e. what dish would the sambar be accompanying. MTRas new Spicy Sambar is targeted at home-makers who are always looking at delighting their family members by providing the best home-made food through breakfast, lunch and dinner and the perfect Sambar to go with it. While the classic variant has always been popular, there is a clear need for a spicy variant so as to cater to a wider usage opportunity. With constant innovations like these, MTR Foods has understood Indian dishes and the authentic recipes. However, we do face one challenge on the consumer front - adoption. Consumers resist change in familiar formats. So while they will experiment with cuisines, changes in their favorite Indian food are harder to get accepted. To combat this, our products are evolved only on truly authentic Indian recipes that can disrupt the daily consumption habits of consumers. These products represent the practice of great taste and quality, they are identifiably from their region of origin and packaged in innovative and convenient formats that make our consumers lives easier. MTR has constantly strived to preserve the vast culinary culture and subculture of India and hence the culinary secrets are protected and handed down over the generations. MTR's journey to being India's leading processed food company will continue to be marked by a constant focus on innovation and the adoption of new technology. The entry of technology and mobile application-based services has led to a massive transformation in how the food industry operates. With consumer demographics comprising young and urban professionals, FoodTech has been amongst the most promising sectors within the Indian startup ecosystem.Segments like box delivery and on-demand meals are becoming increasingly popular, leading to an unprecedented number of startups joining the race for market share. In this vast scope of venture opportunities, Brand Capital provides marketing and advertising leverage to startups that have the potential to make it big through its branding prism. One such startup that has flourished with Brand Capital's advertising strategies is Faasos - India's leading Food-tech company. Faasos was started by Jaydeep Barman and Kallol Banerjee in 2011 with the vision of being an Indian Quick Service Restaurant (QSR) brand. The company quickly expanded to multicity operations and grew to over 50 stores in the next few years. However, the challenges that the availability of retail infrastructure posed on a pure retail play was soon evident. In mid-2014, Faasos conducted a survey among its users to understand two things: awareness of the brand and whether the full-stack model was working. The survey results proved to be an eye-opener: over 76% of the respondents had never 'seen' a Faasos store, but still ordered food from it. The company embraced technology to move to "online only" demand play. This effectively meant that the company could avoid costly rentals in high footfall areas and instead operate out of dark kitchens (100% delivery orders) located anywhere in a catchment. Two new markets Hyderabad and NCR were launched without a single visible outlet. The success proved the model beyond doubt. The advent of ordering apps, however, posed the next challenge. How to be relevant for more and more food ordering missions of the customer. This lead to a key insight and the next stage of the evolution of the company. The company started experimenting with multiple brands operating out of the same kitchen and hence riding on the same supply chain and technology stack. Today the opening of a Faasos kitchen in a locality is equivalent to opening 8 new restaurants offering different cuisines. The branding made sure that they catered to different food missions as far as the consumer was concerned. Startups have risen and fallen due to weak branding and marketing strategies. And sure enough, Faasos dealt with a few of its own challenges. It was during this time the co-founders decided to partner with Brand Capital, the strategic investment arm of the Times Group, to establish an effective & sustainable branding strategy. Brand Capital decided to build on these strengths and focused on building a strong customer relationship in Tier 1 & 2 cities. They helped Faasos reach their potential target audience across India. Faasos launched their app in July 2014 and delivered this message using print media properties such as the main edition of Times of India. This created the required buzz and Faasos scaled up to unimaginable heights! Today, the company, which had six outlets in Pune in 2011, is present in 15 cities and services 30,000+ orders every day across India. 95% of their orders are received via their mobile application. Faasos has come a long way since its inception but has always stuck by their brand agenda - 'Eat Good, Eat Exciting!' 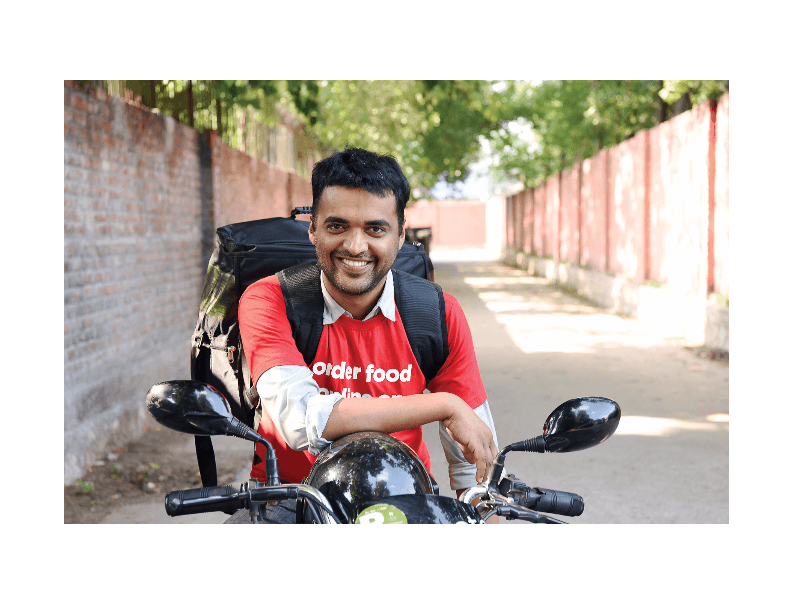 It has been almost 7 years since Jaydeep Barman co-founded Faasos with Kallol Banerjee. Being in this space for over a decade, Jaydeep speaks from experience and shares the following key points for young entrepreneurs wanting to build a QSR or a food-tech startup: Entrepreneurship is, in essence, a form of protest against status quo. Be very clear what form of protest it is. A statement ( a small and personally supervised operation) or a movement ( which will involve relying on other people's judgment). Choose what you want to inspect very carefully because only what you inspect will improve and innovate. Try to solve problems at its causal level and through technology. More people and more money will only postpone the inevitable. Remind yourself every day that people generally come to work with the intention of achieving something worthwhile. Build the enabling environment. To know more about Brand Capital, visit here / Follow on LinkedIn and Twitter. Indians love to celebrate every occasion in a special manner and Indian wedding is never complete without adorning bridal jewellery. Indian wedding jewellery is very special and tends to grab the attention of everyone with intricate design and beautiful making. The beauty of each jewellery piece lays much deeper and is the blend of beauty, spiritualism, cultural essence for an auspicious occasion like a wedding. Without decking up, a bride's look is not complete which renders a majestic look. Bridal jewellery includes various kinds of jewellery right from the engagement ring, diamond jewellery set including Maangtika, chandeliers, cocktail ring, polka or traditional motifs and many others. When it comes to bridal jewellery collection of Avama Jewellers, the list of wedding jewellery pieces go on and on. At Avama Jewellers, you can find the latest collection of exquisite jewellery pieces to add a touch of effervescence to the look of the bride and all the exquisite jewellery pieces to be adorned by an Indian bride to complete her look. A wide collection of latest jewellery set of 2019 Donning a beautiful jewellery piece has more to do with making a statement rather than adding glitz and glam to an ensemble. The kind of jewellery you carry ultimately speaks a lot about your dressing and style sense. Abhishek Kajaria, the director of Avama Jewellers introduces hundreds of choices in Maangtikka, earrings, nose pins, bangles, diamond engagement rings and pieces that are a blend of conventional and contemporary style. The leading jewellery brand caters to the wardrobe needs of a bride from top to bottom. There is jewellery for every bride and her bridesmaid here. The jewellery combos like Kundan earrings, sparkling diamond Maangtikas, head gears, dashing bangles are an absolute hit among the brides. Jewellery for all days of wedding celebration A bride wears jewellery not only on the day of a wedding but other days too. They include pre-wedding photoshoot, 'Mehendi', 'Sangeet', wedding day and reception party. There is an entire range of adornments right from brooches and earrings to the dazzling necklaces and bangles. Jewellery pieces are available for the exact designer lehenga, and they are Kundan Bollywood inspired. As per the design and work on the designer bridal lehenga, make your selection of pieces. You can get everything from gold plated antique jewelry to match Zari entrusted lehengato complete the look, multi-stringed charming pearl necklace, bangles, maangteeka, waist belt, and many others. Plenty of options in the jewellery pieces As per the wedding occasion or event, you should match the jewellery pieces. You can also procure heavy traditional wedding jewellery from head to toe. While an ethnic style pendant set goes well for Mehendi, a gorgeous engagement ring is a center of attraction on the day of engagement. For the reception, a diamond choker and cocktail ring go well. Don't forget to match your wedding attire with the jewellery pieces. Abhishek Kajaria, the trustworthy supplier of bridal jewellery, doesn't leave any stone unturned to supply the finest-in-the-line wedding jewellery to complete the contemporary and ethnic attire. A modern bride is sure to carry a royal look to steal everyone's attention. There are hundreds of options in bridal jewellery set in Avama Jewellers. Abhishek Kajaria has years of experience in Indian wedding jewellery industry who can also help Indian couples to choose the perfect jewellery sets. The Grand opening of the store was done by no other than ravishing bollywood actress Ms. Raveena Tandon at Vardhaan market,Park Street area, Kolkata west Bengal. The summers are here and we're already looking for ways to beat the heat. While staying indoors in the air-conditioned comfort of our homes is one way, it usually comes with hefty electricity bills. This is why it is important to choose an air conditioner that not only provides effective cooling with smart features, but is also easy on our pockets. In the recent years, the AC market has been buzzing with a lot of activity. Many high-end technologies have revolutionized the air conditioner. One that really takes it up a notch higher is the built-in air purifier, which has traditionally been a separate product. This has two benefits. It saves space and makes your living area look more aesthetic. Besides, it also helps save the trouble of buying and maintaining an air purifier. Keeping this in mind, the Whirlpool 3D Cool Purafresh Inverter Air Conditioner is a great purchase, offering superb value for money. Here's what makes it so: • 3D Cool Technology This is a revolutionary attribute that redefines cooling. This technology makes use of three unique air vents placed on three sides of the AC that draw hot air out of the room, giving up to 40%*^ faster cooling. The vents are located on the top and sides of the air conditioner. Coupled with a long air throw of up to 12m* and the ability to cool even at extreme temperatures of up to 55 degrees*, this intelligently designed air conditioner packs a punch. Find more about the 3D Cool AC range by clicking here • Built-in Air-Purifier The all-new 3D Cool Purafresh Inverter Air Conditioner comes with a built-in air purifier. With growing pollution levels and cases of respiratory illnesses, an air-purifier is becoming a necessity. While investing in an air-conditioner, one can make the most of it by buying one with a built-in air purifier. The 3D Cool Purafresh Inverter AC can remove PM 0.3 pollutants# at par with the best air-purifiers. In lab conditions, the purifier is effectively able to get rid of 98.6% air-borne pollutants and allergens#. In winters, the built-in air purifier can be used as a stand-alone device. An air conditioner with a built-in air-purifier can also make your life a lot more convenient, because you won't have to bother with owning, installing and servicing two separate devices. • IntelliSense Inverter Technology Inverter ACs and their in-built inverter technology have given air conditioning a cost-effective spin. Whirlpool's patented IntelliSense Inverter Technology optimizes the functioning of the compressor on the basis of the temperature set and ambient conditions. This stabilizes energy consumption and gives you the best deal on the cooling as well as the running cost. Optimal functioning leads to a lifetime saving of up to INR 43,000**. This technology also provides additional benefits such as low noise and stabilizer-free operation (150-264V**), which is a major plus point. What's more, the device operates at a low noise level (37 dB) to make for a soothing environment. In a non-inverter AC, the compressor switches off when it reaches the desired temperature. It gets switched on again once the temperature increases. This leads to higher power consumption. On the other hand, an inverter AC functions constantly, intelligently adjusting to the cooling requirements of the room to maintain optimal temperature. • 6th Sense IntelliComfort Technology Weather conditions in India are extremely hot and humid. The new range of Whirlpool ACs, powered by 6th Sense IntelliComfort Technology, have been designed to make tackling the heat and humidity a thing of the past. The range has been loaded with a smart, intuitive logic chip which ensures that the indoor unit of the AC responds to ambient humidity, i.e. the 'real feel temperature'. This coordinates with the outdoor unit to adjust the temperature and function, delivering up to 27%* energy savings. Another issue with the older variety of air conditioners is that they don't take humidity into account. Thus, in the middle of the night, the rooms feels freezing cold and very dry. IntelliComfort technology senses the 'real-feel' temperature to provide you the best ambient cooling experience. The product comes in two varieties: 1 ton and 1.5 ton. The latest cooling technology is able to deliver energy efficiency with a 3-star energy rating. With a 12m long air throw, it gives uniform cooling in every corner of the room. It gets rid of 0.3 PM pollutants and allergens. Built for the tough Indian summers, the product ensures cooling even at a temperature of 55 degree Celsius*. Design, specifications and features: The indoor unit comes with the following dimensions: 1050 (W) x 320 (H) x 235 (D) mm; Weight - 12 kg The outdoor unit comes with the following dimensions: 780 (W) x 540 (H) x 260 (D) mm; Weight - 30kg The product comes with the following features - power saver mode, comfort sleep mode, summer chill mode, auto-restart, self-diagnosis, self-clean, on-off timer, 2-way air swing The product also comes with a one-year warranty. Impressed already? Click here to upgrade to Whirlpool 3D Cool Purafresh Air Conditioner and beat the summer heat this year. *Results shown are based on internal lab testing done on select models under specific conditions and may vary depending on the testing conditions. ^Testing against select comparable products of other brands available in this segment. #Results shown are based on internal lab testing done on select models under specific conditions and may vary depending on the testing conditions. Purifying efficiency of PM.03 particulate. **Results shown at unit electricity rate of Rs. 8 at 10 hours per day for a period of 8 months over 7 years, as per BEE recommended master sheet comparing Whirlpool 1.5T 5Star inverter AC to 1.5T 2 Star on-off AC based on 2010 split AC ratings of BEE. Our lives are always-on, always-connected and TV is a big part of our cultural fabric. So many of our daily watercooler conversations are centred on what we watch - from binging on reality shows to watching live commentary on an election, from cheering our favourite cricket team to rooting for a much-loved contestant of kids singing reality show - families gather to watch and discuss what's happening on the big screen. Our beloved idiot box has been evolving ever since its inception and is not an idiot anymore. It has become smart. And world's third largest TV brand, TCL, is all set to upgrade India's smart TV market with its newest offering - a TV brand that comes with the most cutting-edge smart products equipped with Android 7. Called 'iFFALCON', TCL is calling it its 'Crown Jewel'. Say hello to great content and intelligent technology Designed to cater to the growing demand for innovative smart TV offerings within the country, iFFALCON is a smart internet TV brand customised for the Indian market. Its parent company, FFALCON, is a global smart TV operator and the smart TV sub-brand of TCL Multimedia and has been co-invested in by Tencent Digital, China's leading internet content provider. This unique combination enables iFFALCON to operate at the intersection of high-quality content, smart technology, and powerful hardware to provide the most fulfilling and enriching entertainment experience to you. The launch of iFFALCON means you will have an amazing and ultimate home entertainment, audio, and visual experience. The pioneering development also introduces smart TVs equipped with Android 7, marking a significant upgrade on the current offerings within the country's smart TV market. Through its exclusive partnership with Flipkart for iFFALCON, TCL is aiming to deliver a highly-customised, one-stop technological solution aimed at fulfilling the varied entertainment requirements of the country's growing and vibrant young consumer base. You may choose from the two variants: iFFALCON F2 (32 inch) HD Ready LED Smart TV and iFFALCON K2A (55 inch) Ultra HD (4K) LED Smart TV competitively priced at INR 13,499 and INR 45,999 respectively.. Get ready for an enriching entertainment experience Speaking on the need for a smart TV brand like iFFALCON in India, Mr. Mike Chen, Country Manager - TCL India, said, "Even as India's young population is moving towards consuming more internet-based entertainment on a daily basis, the smart TV market in the country remains highly fragmented. Multiple smart TV offerings have been launched till date, but none quite provide the level of customisation and convenience that new-age consumers are demanding today. This is where iFFALCON steps into the picture. Through in-depth product personalisation, we are addressing the need-gap in the market by catering to India's end-to-end home entertainment requirements." iFFALCON's high-quality TV products are equipped with the latest technology and are supported by the strong background in global smart TV operations and extensive resources of its parent company. FFALCON currently serves customers in 135 countries on six continents and has more than 25.53 million users globally, of which 44% are daily active users. Through its robust partnerships with leading content providers such as YouTube, Netflix, and Eros Now, iFFALCON also provides a rich and diversified content library to its customers, further underlining why it is being hailed as a potentially game-changing development within the smart TV ecosystem in India. Bengaluru - GotMatter Pvt Ltd a Bangalore based IT & E-Commerce company has succeeded in acquiring Ridaex Technologies which had made a name for itself by manufacturing the 1st Indian Made LED Smart TVs. In fact, this is the first acquisition by GotMatter. Now the whole legal rights of Ridaex Technologies is owned by GotMatter from 8-2-2018 and will take complete control over the manufacturing, marketing & sales of the same. GotMatter a technology-oriented company which has learnt how to thrive the current Indian Television market has previously taken a biggest financial hit when it was just the sales and marketing partner, due to the damage of Televisions during the transit via logistic partners. By just not giving up the challenge, GotMatter has performed a 1.5-month packing research and came up with the idea of MDF Premium Packing which has cut down the damage rate by up to 92% in just few weeks. Starting TeamViewer Remote Quick Support was one of the best tech steps ever taken. Where Ridaex is the First Indian Television Company to start such advanced troubleshooting, sitting right at the work desk of a technician one can soft service any Smart Tv across the globe. The acquisition will strengthen the company's position as an agile and innovative company. It will also enable the company to elevate sales and increase expertise in customer service and enhance its business intelligence. Commenting on the announcement, CEO of GotMatter, Naveen Srinivas said: "I am delighted about this acquisition. It is a further demonstration of the success of our independent network strategy and never backing down attitude". Since the merge of Ridaex with GotMatter, a lot has been changed in management. Firstly, the addition of new and efficient manpower to the team. Secondly, a complete make-over from the scratch just to make sure everything runs efficiently without complications. Ridaex TVs are now getting more technologically advanced with new ideas and innovations taking birth every day. GotMatter promises to be the leader in technological advancements when it comes to consumer electronics in the coming years. GotMatter has also started working on expanding the manufacturing unit due to the increasing demand of the Ridaex TVs just after the launch of it's 50 inch TV. It is also planning to add some more consumer electronic products to its E-Commerce site at the most affordable price. In terms of sales GotMatter is totally amped up with new and safe logistic partners for faster and safer delivery after some claims complaining about the delay in delivery of the products. GotMatter is training new technicians for the purpose of demo and installation. It has also revised their delivery pin codes from 6,300 to 11,535 as on Feb 2018, so the PAN INDIAN sales reach are as twice as 6 months before. GotMatter has also set up 12 new service centers across the country just to make sure there are sufficient service centers. GotMatter services have increased the number of customer support executives to a larger number just to ensure each and every query of a customer is resolved at the earliest. GotMatter is expanding it's selling platform by adding Ridaex TV's to other leading E-Commerce websites such as Flipkart, Amazon and Paytm very shortly. GOOD TO HEAR Being an Indian based company, GotMatter also pledged to give 10% flat prize concession for Indian Armed Force current and Ex-serviceman on the purchase of all Ridaex Products. Ridaex is the new brand name that sounds like Chinese, but a Fully Authentic Indian Smart TV Manufacturing Company that has gained control of the leading front in the field of consumer electronics. Ridaex Smart Tv's are Android-powered LED Televisions which was launched in 2017 in Bangalore under GotMatter E-commerce platform with the plethora of Indian consumer expectations as it was the one and only Indian made television brand. Under the " Make In India " scheme, Ridaex Technologies assembled a group of talented engineers and a set of skilled workers did research for 14 months and then pioneered the art of Television manufacturing and thus Ridaex Smart TV built it's manufacturing unit in Rajkot, Gujarat where 93% of its components are being manufactured natively and the rest 7% are being imported from Hong-Kong. Well reputably Ridaex Smart TV's has outreached the expectations of every TV enthusiasts and consumers across the country with its revolutionary design and technologically advanced features. Ridaex is the first Indian consumer electronics manufacturing company to start the most advanced technical support service via TeamViewer, Where a Ridaex engineer sitting right in his office can service your smart tv at home. Nowadays it is hardly possible/a futile attempt for a new firm or a startup to penetrate into the consumer market which is filled with dominance and lots of tough competition from the leading edge innovators of the television manufacturing industry. None the less/ in spite being a startup Ridaex TV took a daring step forward and launched its Television "Changing the way you see a Tv". Since then, it has gained a lot of trusts and emerged a winner with sales of about 35,000 TV units in about 4 months overtaking Sony and Samsung. Ridaex TV tasted the success just by launching 4 of its variants, 32 inches RE-1320, 42 inches RE-1420, 50 inches RE-1500(FHD TV) and 50 inch RE-1500+ ( Best Selling 4K TV in India 2017) in under 4 months. Ridaex Smart TV outsold the sales of Sony, Samsung, Vu Tv just by launching these 4 variants while the big giants have a whole lot of different TV variants under their belt but still could not reach Ridaex's level of success. GotMatter is planning to launch its 55 and 60 inches variants by the mid of January 2018 and also have plans of launching its curved TVs soon in the future days. Ridaex TV is gaining a lot of reputation and trust of the consumers as it is cruising through as the top-selling economical SMART TV in India. People start to believe in a product when they get to know the product on which they are investing their wealth does not go in vain and when they get the product as promised a trust is developed and this is the exact kind of trust that every seller expects to have with their consumer. In the beginning, it was very tough even for Ridaex to gain the trust of the consumers but somehow managed with its Android operating system and technologically advanced specifications which are no lesser than any Sony or Samsung TV in comparison except for the size. The Indian consumers were also skeptical about buying the Ridaex TV as it was made in India and people had a blind belief that a product made in India would not be worth buying but Ridaex TV proved it wrong by offering huge offers and cash backs attracting a lot of consumers to give it a try and it ended up being the top 50 inch LED TV of 2017 by selling early 14k 50 inch TVs. People believed Ridaex for offering top class features at the economical price and Ridaex cultivated a thought in people's head, "why? Spending so much on a TV when you are getting the same kind of TV at a very lower price". There are many TV manufacturers some very reputed some are fading away and some still struggling to find its way through the consumer crowd but the only one who always stands on top is the one who can provide the best quality along with compact features and still keep the price economical. Ridaex TV has already triumphed over and is the top best alternate for Sony, Samsung, Vu Tv and many other TV manufacturers and plans to stay ahead, that way in the upcoming years too. The possibilities of Ridaex is vast and ever-increasing and the urge to innovate something new keeps GotMatter ahead of everyone in the field of consumer electronics following the motto of "Changing the way you see a Tv" and with its smart features and economical price Ridaex TVs are sure not settling down anytime soon without a rumble with tech giants.